An opioid abuse epidemic fueled by prescription drugs. Public outcry over high drug prices. A huge backlog of generic drug applications. Industry stakeholders pressing for faster approvals. Former clinical researcher Dr. Robert Califf recently took over a U.S. Food and Drug Administration that is heading into an era of unprecedented challenges and change. The decisions he will make over the next few years—assuming he holds on to his job in the next administration—will redefine how drugs, medical devices, tobacco, food safety and controlled substances are regulated in the 21st century. For that reason, Modern Healthcare has chosen Dr. Califf to top the list of the 50 Most Influential Physician Executives and Leaders. President Barack Obama's appointee got off to a rocky start. Though his nomination received bipartisan support, several Democratic lawmakers attempted to block his confirmation in an effort to get the FDA to take a more active role in trying to curb the widespread use of prescription opioids. These regulated products are the major driver behind a growing abuse epidemic responsible for killing well over half the 48,000 people who died from drug overdoses in 2013. Some consumer groups challenged his connections to regulated industries while at the Duke University School of Medicine, where he served as a clinical researcher and adviser to numerous drug companies. They expressed doubts about how he will use his power to shape and eventually implement the 21st Century Cures Act, the House-passed overhaul of the rules for approving drugs and devices that is designed to get medical breakthroughs to market sooner. 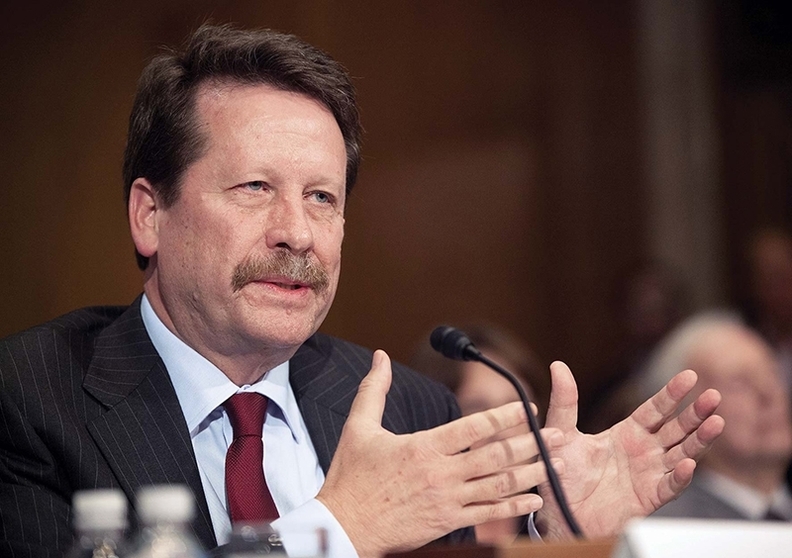 In an exclusive interview with Modern Healthcare, Califf said strengthening the FDA workforce is his No. 1 priority. That requires attracting top talent to the agency, as well as retaining current employees by making the agency a more appealing place to work. Complaining about the adequacy of the FDA workforce is a constant refrain in Washington. But the job of protecting the public from unsafe or ineffective drugs and devices will only get tougher should Congress create a regulatory environment that generates less-definitive clinical trial data for new drug and device applications, and asks the agency to make its decisions more quickly. Among the proposed provisions is a change that would allow a drug to be approved with a “breakthrough therapy designation,” based on evidence from its early-stage testing. Another provision would allow manufacturers to get accelerated approval for a drug based on its effect on a surrogate endpoint—a lab test result like lowered cholesterol that predicts health benefits, but hasn't yet been shown in clinical trials to improve patient outcomes. Given the prospect of greater scientific uncertainty, critics wonder whether Califf will remain impartial and hold the line on safety and efficacy standards. They cite his long-standing financial ties with drug companies while directing the Duke Clinical Research Institute. “The attitudes he's formed will lead him to make decisions that weigh in favor of industry instead of public health,” charged Dr. Michael Carome, director of the Health Research Group for the advocacy organization Public Citizen. Critics of some of the reform measures proposed by Congress, including former FDA Commissioner Dr. Margaret Hamburg and her former top deputies, are more concerned about the agency's ability to simply keep up with changed regulatory standards. The agency will need additional resources to train existing and new personnel to keep up with evolving regulatory science if it is going to play its traditional role of guiding the industry through the process of developing new drugs and devices without causing unexpected harm. Given the election year uncertainty, Califf will probably use the next six months to chart future plans. The one exception is an initiative on opioid abuse, which has become a major issue on the campaign trail. With the Obama administration ending in less than a year, experts say Califf will move cautiously on other issues, in hopes of maximizing his chances of being retained by the next administration—by whoever wins the election. “I would be surprised if there were many groundbreaking positions that could be controversial politically,” said Marc Scheineson, a partner at the Washington, D.C.-based law firm Alston and Bird, who previously served as associate commissioner for legislative affairs at the FDA.